Today’s 20 Below item is really an exciting one! 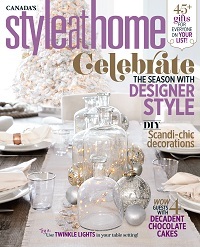 The Style at Home November 2015 issue has a beautiful white cover featuring a tablescape by blogger Monika Hibbs. Not only that, but it features design work by my fellow design-savvy bloggers: Tim (Design Maze), Jen (Rambling Reno), and Christine (Bijou & Boheme). Each of them styled a holiday scene, and their styles are very distinct. This issue also highlights Sarah’s (The Curated House) beautiful laundry room (a reno that was completed in only 6 weeks) and some gorgeous homes across the country. Honestly, folks, it’s a good issue!